Churches and Halloween – now that brings up an interesting vision doesn’t it? First let’s explore the history of this festive holiday. Wikipedia and Britannica Online mentions that Halloween has roots in the ancient Celtic festival of Samhain which is celebrated at the end of the harvest season. The Gaels believed that on that date, the window between the living and the dead was very thin and could be crossed easily. In order to pacify evil spirits, costumes and masks were worn. “All Hallow’s Eve” became Halloween – the eve of All Saints Day, a Christian observance. The date for All Saints’ Day was set at November 1st in the 800s by Pope Boniface IV. The church day began at sunset, so All Hallow’s Eve and All Saints’ Day coincided for a few short hours. In 1000 A.D. the Church made November 2nd – All Souls’ Day. The early Colonial settlers in America disapproved and forbade the Halloween celebration. In North America churches of different denominations look upon Halloween differently. The Anglicans choose to emphasize the Christian traditions of All Saints’ Day while some Protestant churches refer to it as Reformation Day. Though beginning as a pagan celebration, both pagan and Christian beliefs are intwined in various celebrations from Oct. 31st – November 5th. Some Catholic parochial school children enjoy the holiday by dressing up in costumes. The Boston Diocese has began a “Saint Fest” on Halloween. Others of very conservative or fundamentalist Protestant churches, may see Halloween as trivializing the occult. Others consider that there is no place in Christian belief for Halloween because of the secular origins of the celebration. One tradition from England that has been varied in America, is the giving of food on Halloween. “All Souls’ Cakes” were given to beggars for the promise that prayers for their deceased relatives would be said. This distribution of these cakes was encouraged by the Church to replace the long held practice of leaving out food and wine for spirits. 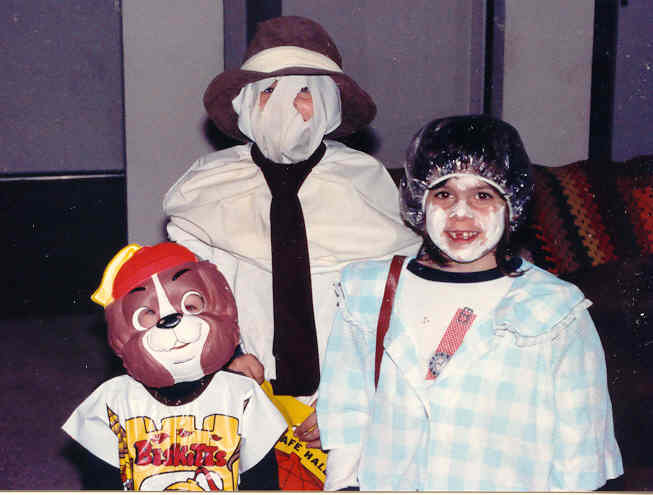 As a child, I would always dress in a costume – usually one that was harmless – and with my parents, participate in “Beggar’s Night”. As a teen, our church youth group would have a Halloween Party, and we would visit the various “Haunted Houses” in the area. These places were set up by non-profit organizations to raise money for various charities – the March of Dimes and Muscular Dystrophy. A local television personality, “Dr. Creep” would often be at the Muscular Dystrophy house to welcome guests. Admission was no more than a dollar or two (this was back in the mid to late 70s) so it was pretty easy to hit every Haunted House in a ten mile radius on one evening and not break the bank. I remember how cold it used to be standing outside in the long line waiting to get in. Most of the actors were members of the non-profit or volunteers who worked every evening for a few weeks, sacrificing their own agendas, in order to help raise money. They also knew when enough was enough and who they could really scare and who they needed to be a little extra careful with. As an adult, I’ve enjoyed having my children dress up for Halloween and either taking them around the neighborhood or (while my husband does that) staying home and passing out candy. When I was a child, people were still allowed to give out candied or caramel apples, homemade popcorn balls or cookies. Unfortunately, due to some pretty foolish people who chose to hurt children by lacing homemade goodies or apples with harmful substances, we rely on pacifying kids with sugar-laced candy. I’ve also dressed up on more than one ocassion for either an adult Halloween party or our church’s Halloween Festival. Yes for a number of years our church was still celebrating Halloween. We didn’t call it a “Fall” festival like so many other churches or schools or organizations in order not to “offend” anyone. It was a fun time to dress up and have fun. The Youth would run games and a cake walk and everyone would have a good time snacking and enjoying fellowship. The kids even got to wear their (not scary) costumes to church on a Sunday before Halloween and have a costume parade through the Sunday School classes. Halloween – or any celebration and holiday – with roots in the secular and pagan world – can be as innocent or evil as we make it. Due to a very busy schedule, my Freaky Friday articles will be suspended for the time being. I haven’t had much time to come up with creative posts. I will possibly be submitting something for Halloween along the “Freaky” aspect of the posts. Apologies for those who tune in to read these. Regular posting will continue. Since my day to day life has become quite a bit busier lately, I am only going to be running the Freaky Friday posts on the 1st Friday of the month. I’m also hoping this way they won’t get stale or I run out of ideas – whichever comes first! So the 6th Edition of Freaky Friday will be posted on Oct. 3rd. I may also do a Special Freaky Friday post to celebrate Halloween! Don’t forget – anyone can get in on this! Just let me know so I can provide a link! The hosts of the show, Ken Hardin and Don ?, on the “Ken and Don Show” on the Dayton channel, WHIO, in the 1960s. This show was broadcast after school and during the programs and cartoons, Ken and Don would tell jokes, play games with the audience, and other things to keep us entertained. This was a venue for all the scout troops or other childrens’ groups in the community to attend. I think our Brownie troop actually appeared on the show two years in a row. So why did I pick these pictures for the 5th edition of “Freaky Friday”? 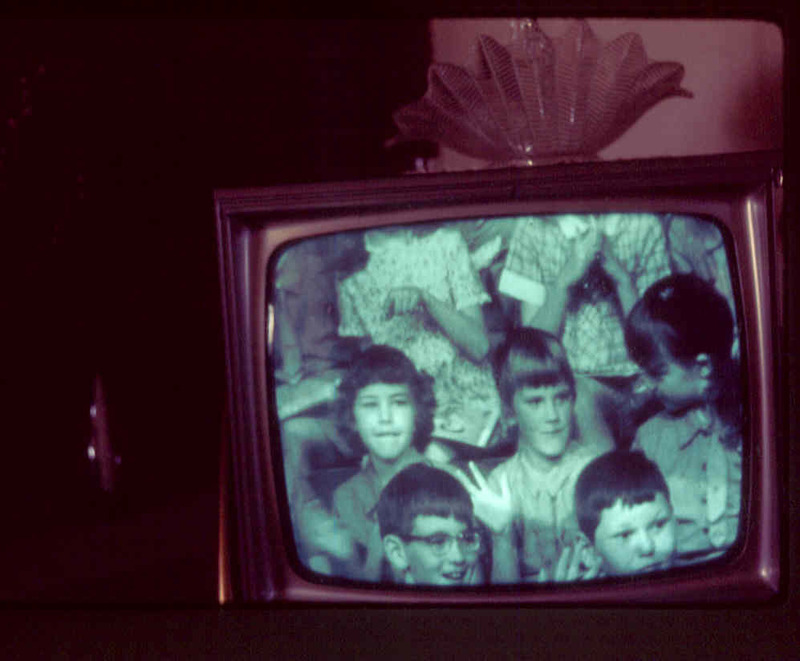 Isn’t it sort of weird the things we did back then when we didn’t have VCRs or DVRs or Tivo? We took pictures of the television! Today’s “Freaky Friday” edition explores what I would encounter if I lived in a different era. I thought it would be easier if I started with the decade prior to my birth and then move backwards! Women weren’t entering the work force as more than nurses, teachers, switchboard operators, secretaries, waitresses or stewardesses (notice the different terminology than today?). Generally if women attended college, it was for a nursing or teaching degree, to get involved in a sorority which could help them move in the correct social circles or to find a husband. They weren’t inspired to reach for the sky to do anything they desired. Young women wore poodle skirts, rolled up blue jeans, penny loafers and bobby sox. They dressed conservatively lest they be saddled with an unsavory reputation. Married and older women wore tailored suits to church and social ocassions. They were polished and dressed well when they were out in public. Rock and roll was brand new and under close scrutiny from parents and those in authority. Musical artists who came into their own during this decade include Elvis Presley, Buddy Holly, Johnny Cash, Jerry Lee Lewis, Chuck Berry, and Bill Haley and the Comets among many others. Women who were married, especially after children were born, stayed at home and ran the household. Not only was she the housekeeper, the cook, and the laundress, but she took care of everyone’s schedule, made a hot meal three times a day, joined the PTA, the church ladies organization, and community or social groups. In conclusion, I can’t honestly say I would be less happy in the decade of the 1950s as I am today. My parents were older when I was born so they had lived through the Great Depression, World War II, and the 1950s so they had the values of the time. In many ways my values were shaped from how I was raised and the ideals within my family. Yet, I’ve come to appreciate and sometimes depend on the technology we have today. Don’t have time to go to the library, check the internet. Want to see a movie that no one else in the family wants to see, download it and watch it whenever you want on your computer or Ipod. Forget what else you were supposed to buy at the store, use the cell phone to call home. Don’t have time to wash all those dishes, load the dishwasher. Don’t have time to preheat the oven and cook dinner, set the microwave. Unfortunately the down side to all of this is that patience is tested – not only for waiting for a page to download from the computer but waiting in line at the post office or in traffic. Not often is there time to actually stop and smell the flowers let alone eat two or three meals together each night. Days are scheduled down to the last minute without any give built in for spontaneity and fun. Perhaps it’s time to bring a little of the 1950s “slowness” to modern times – if only to be able to appreciate each day before it draws to a close, lost forever in all those other days that we eventually wish we could have again. This weeks’ Edition of Freaky Friday includes two posts! Enjoy! Due to circumstances beyond my control (spending all day at a car dealership and all evening discussing the vehicle sitting in front of our house) – my original 3rd Edition Freaky Friday post will be published next week! The older child is my grandfather, Glen R. Johnson. The younger child – unknown. As far as I know – no one knows who this is. My grandfather didn’t have a younger brother. He his 12 years older than his sister, Eva, and I don’t think my grandfather appears to be of the correct age. This isn’t a very good scan of the photo but the younger child is dressed like a boy so I don’t think it was a girl. My thought it could be a cousin or even a friend. Did people generally include non-family members in photos in the early 1900’s? My Grandad and this unknown child are dressed like “men”. They appeared very uncomfortable in these photos – wearing clothes that made them look “old” instead of children. I tend to think this photo and another one taken at the same time of the same unknown child with Grandad – are rather odd. I am updating the list of ideas for the “Freaky Friday” challenge as I thought of something that truly is “Freaky” but didn’t fall within any of the categories I’d listed. And since I started this challenge, I get to change the rules! So here is the update. Number 5: Submit information on actual events or photo or two that screams “Freaky” or “Friday” (or both!) and explain. When I was about nine years old, a friend of my grandparents passed away. Since my parents and I also knew the lady, it was expected that we attend the visitation. As Mom was explaining exactly what I would see, I turned and gave her a quizzical look. When she finished speaking, I replied, “But I’ve been to a funeral before.” She said no, I’d never been to a funeral or inside a funeral home or been to a viewing before. Yes I had, I argued. The lady in the pink dress. Mom just shook her head but didn’t say much after that. One of my earliest memories was of a small, white funeral home out in the country somewhere. To this day I can still recall the flowers that grew on the trellis outside. I can see the men in their white shirts and narrow black ties. They had short hair and were standing outside in the sunshine. The coffin was white but I was too little to see the lady inside. Someone put a step stool down so I could stand on it. As I peered inside at the lady, I remember she had on a pink dress and she had a head covering on – sort of like a hair net but it was opaque. I distinctly remember thinking that it was my aunt. My Aunt Genevieve died three years before I was born of inoperable brain tumors so I had never met her – let alone gone to her funeral. Many years later when I was back in the Dayton area for a vacation, I was at my brother’s house, and we were talking about how we’d sometimes have deja vu. He asked me if I’d ever had a dream (or vision) of a lady dressed in pink dress lying in a coffin. I almost fell off the couch. He went on to tell me his own version. He remembered that she had on a pink nightgown and part of it wasn’t covering her stomach. There were lots of black stitches running up and down her abdomen. He always called her the “watermelon” woman because the stitches reminded him of watermelon seeds. Our desciptions of the funeral home were also very similar. Then he told me that our sister had mentioned something close to what we were describing. I’ve never asked her if that’s true. All three of us also have a very heightened sense of deja vu. My sister used to argue with my mom that she’d been somewhere before upon the first time she’d enter a house. Mom finally gave up trying to argue with the unknown. Needless to say, my first actual time at a funeral home and being in the presence of someone who had died, did not bother me as it might for a small child. I tend to think it’s because I had truly believed I’d already been through that first experience and the fear of the unknown was over.